Insurance for newlyweds, it’s one of the least fun topics when it comes to getting married. So it’s easy to put the conversation off as long as you can. This guide will simplify the process and get you back to planning for your big day sooner. In Missouri, you must have auto insurance….it’s the law of the land. If you’re in an accident, is your coverage adequate? I’m going to step out on a ledge and guess you test drive cars before you actually buy one? You want to know how it drives. How it feels. How it smells. What kind of gas mileage does it get. Am I right? The same goes for insurance. It may not be the sexiest thing to talk about, but until you get down to brass tacks and have some serious discussions you may be setting yourself up for a financial catastrophe. How does my auto insurance work? There are no stupid questions. If your insurance agent makes you feel stupid for asking questions, tell him/her to take a hike. You have to be able to trust your insurance agent. You have to be able to have open discussions about your personal/financial situation. Do you remember when you were young playing in the ball pit at McDonald’s? That’s a little what it feels like when you open all of your wedding gifts. Renter’s insurance will cover your personal belongings (all of those new wedding gifts) inside of your home or apartment if you experienced a fire. However, did you know if a pipe bursts and ruins your stuff you’re covered? Or if a burglar breaks-in and steals from you? Or even a lightning strike that takes out all of your electronics? These are all covered under a MO Renter’s insurance policy. Of course it would be subject to your deductible. 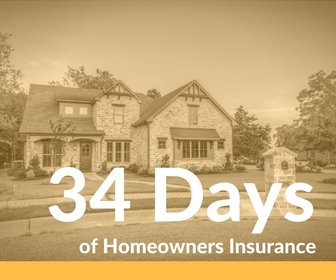 But did you know renter’s insurance does more? You’re at the grocery store on your phone pushing a shopping cart, not paying attention to what’s ahead of you. BAM! You run into the ankle of the lady in front of you. She ends up having surgery, rehab, and time off work. Guess who she blames…? Maybe that’s a silly example. You want to surprise your spouse by cooking dinner and accidentally catch your apartment on fire. If you’re found at-fault, you may be liable. At this stage of life, you may not have much wealth or assets. But in the event of a significant legal claim, an attorney could go after assets you don’t even have yet. Maybe you file bankruptcy, but the court may require you to pay back everything for the injury or loss. Without liability protection, your wages may be garnished for several years and credit ruined. What if you suffered a fire? Where would you live? If you find yourself living in a hotel and eating at restaurants for 3 months while your apartment is under construction, a renter’s policy will help pay for these expenses beyond the norm. Marriage is an exciting time. It can be a flood of emotions. Life insurance is the last thing you want to talk about. It won’t bring your loved one back, but it will help take care of final expenses if the sudden and unexpected should arise. How much would a funeral cost? How quick would you go back to work? Do you owe money on anything (i.e. car, credit cards, college, etc.)? How long would you need your spouse’s income…1 year, 10 years? The goal is to take care of these expenses so you’re not left trying to afford them by yourself. A Term Life Insurance policy is a good way to take care of these needs. Term policies usually come in 10, 20, and 30 year plans. It has a specific start date and end date. So if you started a 30 year policy today, in 30 years it will expire. As life brings new chapters (i.e. buying a home, having a baby) it’s a good idea to reevaluate your life insurance as your family’s situation and needs change. Here’s a handy website to calculate your needs. Your spouse just spent a couple of months salary to buy your ring(s). If you fear you might lose a diamond or worried someone may steal your rings, ask your insurance agent to schedule each piece of jewelry. You will want to ask the store you purchased the rings from for a certificate verifying the value for insurance. If the jewelry is an heirloom you will want to have it appraised. This will cover you for the value of the ring. Then if something should happen, you’re covered. The same can be done for your husband’s guns or mint condition Stan ‘The Man’ Musial baseball card. As you embark on this new chapter in life, find a trusted insurance professional to give you honest advice. Anyone can sell you an insurance policy, but having a teacher in your corner is second to none.